PORTLAND, Ore. (AP) — Portland officials are concerned about the dozens of rail cars filled with Canadian tar sands crude oil that travel through the city. PORTLAND, Ore. (AP) — A member of the right-wing Proud Boys group was arrested Tuesday in Oregon after being indicted last month on assault charges. Portland, Oregon, police say commander will not work with a specialized rapid response team he leads while the city investigates texts between him and the leader of a far-right group. PORTLAND, Ore. (AP) — The Portland City Council has voted to withdraw the city from the Federal Bureau of Investigation's anti-terrorism task force, citing a deep distrust in the program's ability to root out terrorism while upholding the civil rights of residents. PORTLAND, Ore. (AP) — Portland police have renewed an effort to equip officers with body-worn cameras. PORTLAND, Ore. (AP) — Mayor Ted Wheeler's chief of staff has resigned. The Oregonian/OregonLive reports Michael Cox sent a two-sentence email to Wheeler Friday morning, saying his resignation would be effective Monday. In a statement, Wheeler thanked Cox for his service and lauded him not only as a trusted and loyal adviser but also as a friend. PORTLAND, Ore. (AP) — Public records show Portland officials are in the early stages of exploring whether the city may create a jail alternative for people arrested for non-violent acts related to mental health or addiction. PORTLAND, Ore. (AP) — The future of the Pearl District - one of Portland's most popular neighborhoods - is up for discussion. A planned Monday meeting will be the first of a series of town halls of sorts with both city leaders and residents in attendance. PORTLAND, Ore. (AP) — A review of city financial documents by The Oregonian/OregonLive has found that the cost to Portland taxpayers for security guards at City Hall has jumped more than fivefold in less than two years. PORTLAND, Ore. (AP) — The Portland City Council on Wednesday rejected an ordinance that would have given Mayor Ted Wheeler new powers to regulate protests. The mayor's proposal failed 2-3 when Commissioner Nick Fish cast the deciding vote against it, the Oregonian/OregonLive reported . PORTLAND, Ore. (AP) — The Portland City Council heard testimony on an ordinance that would give Mayor Ted Wheeler immense new powers to regulate protests, an idea that residents told city officials is wrong. PORTLAND, Ore. (AP) — Portland Mayor Ted Wheeler says he will crack down on "street brawls" in Portland after a weekend protest turned into a fight between right-wing Patriot Prayer members and left-wing counter-demonstrators. PORTLAND, Ore. (AP) — The union representing U.S. Immigration and Customs Enforcement employees has asked Oregon and federal officials to conduct a criminal investigation of the Portland mayor over his response to immigration protests. PORTLAND, Ore. (AP) — A Portland woman is planning to sue the city after she was injured when police used "flash-bang" grenades and other crowd-control devices against people protesting a rally by extreme-right demonstrators last month. PORTLAND, Ore. (AP) — Protesters clashed with guards at Portland's City Hall after briefly shutting down a City Council meeting. Scores of activists showed up Wednesday morning to express anger at how police treated those who demonstrated against a far-right group that held a rally at the Portland waterfront on Saturday. The chanting protesters prompted Mayor Ted Wheeler and other council members to walk out. The meeting was then shifted to a conference room that protesters could not enter. PORTLAND, Ore. (AP) — A push to open a homeless shelter in downtown Portland, Oregon, has run into budget issues over the cost of cleaning up the site where it's planned. Soil at the location beneath the Broadway Bridge is contaminated from nearby railroad tracks and must be covered with a protective cap estimated to cost $170,000, according to city documents. PORTLAND, Ore. (AP) — Portland's mayor has warned protesters camping at the office of the federal Immigration and Customs Enforcement agency to disband before they are removed by police. PORTLAND, Ore. (AP) — Portland's police oversight agency has launched a probe into how officers interact with homeless people following an analysis by a newspaper. The Oregonian/OregonLive found that one in two arrests made by Portland police was of a homeless individual while less than 3 percent of city residents are considered homeless. PORTLAND, Ore. (AP) — Portland taxpayers will pay $26,000 for a resident's attorney fees after he won a lawsuit against Mayor Ted Wheeler over a public records request. The Oregonian/OregonLive reports the city council approved the payment Wednesday, ending a months-long dispute between the mayor and Tyler Bechtel, an east Portland resident. On Thursday, Portland City Commissioners are poised to consider a new five-year deal for banking services with an old partner — Wells Fargo. PORTLAND, Ore. (AP) — The Portland City Council plans to give developers the option of building taller buildings in the city's New Chinatown-Japantown historic district. The plan includes new height and design guidelines intended to preserve the character of the historic district, which is the state's largest Chinatown community, Oregon Public Broadcasting reported . PORTLAND, Ore. (AP) — Mike Abbate, the director of Portland Parks & Recreation, has announced his resignation. The Oregonian/OregonLive reports that Abbate told city officials on Monday that he is resigning "to pursue other opportunities." The 60-year-old Abbate wrote to the city that being the director was the greatest honor of his professional career. Abbate's resignation comes as his bureau is facing the prospect of a steep budget cut. SALEM, Ore. (AP) — The Portland Marathon board of directors has canceled this October's race and plans to dissolve the 47-year-old organization following a state investigation into the group's operations. PORTLAND, Ore. (AP) — A Portland man has sued the city and Mayor Ted Wheeler, claiming the mayor's office has improperly kept secret records about a homeless shelter project. PORTLAND, Ore. (AP) — Students across Oregon left class Wednesday to join a call by young activists for stricter gun laws. Students throughout the United States were asked to leave class for 17 minutes — one minute for each of the dead in last month's massacre at a Florida high school. PORTLAND, Ore. (AP) — Six activists filed lawsuits Thursday against the city of Portland, asserting they were roughed up by police at various protests. Street activism and public marches are common in the progressive city, and the lawsuits alleging battery note the long history of clashes between police and protesters. Attorneys for the plaintiffs said in court documents that the Portland Police Bureau has become "increasingly militarized" in its tactics. SALEM, Ore. (AP) — Oregon legislators have sent a proposal to Governor Kate Brown that would allow the state's largest city to coordinate with the Department of Transportation to remove homeless encampments. After the House approved the bill last week, the Senate approved it unanimously Monday, sending it to the governor for her signature. PORTLAND, Ore. (AP) — The city of Portland has reached a proposed $10 million settlement with water and sewer ratepayers who questioned spending ratepayer money on non-water-related programs. The Oregonian/OregonLive reports that the Portland Water Bureau and an attorney for ratepayers on Friday announced the proposed settlement. The Portland City Council will consider approving the settlement on Wednesday. PORTLAND, Ore. (AP) — The American Civil Liberties Union of Oregon has filed a lawsuit in federal court against the city of Portland, its mayor and police bureau, claiming they violated free speech rights by using overly aggressive tactics to break up protests in June. INDIANAPOLIS (AP) — Portland International Raceway is back on the IndyCar Series schedule in 2018. The Sept. 2 race on the 1.967-mile permanent road course will be IndyCar's first trip to the Oregon track since races were held from 1984-2007 under CART and Champ Car sanction. PORTLAND, Ore. (AP) — Portland Mayor Ted Wheeler has hired an Outlaw — Danielle Outlaw — to bring stability to a police department that has had a revolving door of leadership. Outlaw is the first black woman to become chief of police in Oregon's largest city. But at her introductory news conference Thursday, Outlaw said she just wants people to see her as Danielle. PORTLAND, Ore. (AP) — A woman with 19 years of experience at the Oakland, California, police department was chosen Monday to serve as Portland, Oregon's next police chief. Danielle Outlaw, who has served as deputy chief in Oakland since 2013, was appointed by Portland Mayor Ted Wheeler, The Oregonian/OregonLive reported (https://goo.gl/SkvYk8 ). PORTLAND, Ore. (AP) — Portland homeowners are expected to pay about $10 more per month for water throughout the next 16 years to cover the cost of a new filtration treatment plant approved unanimously by the City Council. PORTLAND, Ore. (AP) — Portland Mayor Ted Wheeler says if the city wants clean air, it must create a local air pollution authority and stop waiting for the state to fix the problem. The Oregonian/OregonLive reports (http://bit.ly/2gSdSy7 ) Wheeler Friday became the first local leader to endorse the formation of a regional air pollution district, saying industry influence had undercut state attempts to clean up the air for too long. The federal government has declined to revoke a permit for Sunday's pro-Donald Trump free speech rally in downtown Portland. Mayor Ted Wheeler wanted the permit rescinded. He said the event will exacerbate tensions in the city following last week's deadly stabbing on a light-rail train. The mayor of Portland, Oregon, on Monday urged U.S. officials and organizers to cancel a "Trump Free Speech Rally" and other similar events, saying they are inappropriate and could be dangerous after two men were stabbed to death on a train as they tried to help a pair of young women targeted by an anti-Muslim tirade. Mayor Ted Wheeler said he hopes the victims will inspire "changes in the political dialogue in this country." PORTLAND, Ore. (AP) — A Transit Division police officer shot and killed a knife-wielding man who reportedly threatened people near a light-rail station in Portland, Oregon, authorities said Thursday. Investigators recovered a knife from the scene of the shooting, which occurred Wednesday evening, said Sgt. Pete Simpson, Portland Police Bureau spokesman. Police identified the man as Terrell Johnson, 24, a longtime Portland resident who had recently been homeless. PORTLAND, Ore. (AP) — The mayor of Portland, Oregon, on Tuesday condemned the actions of protesters after more than two dozen people were arrested a day earlier during a May Day march that turned violent. The violence and vandalism in Portland and several other Pacific Northwest cities stood out amid largely peaceful marches elsewhere in the U.S. to honor immigrants and support workers' rights. The mayor of Portland, Oregon, is condemning protesters who caused damage to downtown businesses and started fires in the streets during a May Day march. 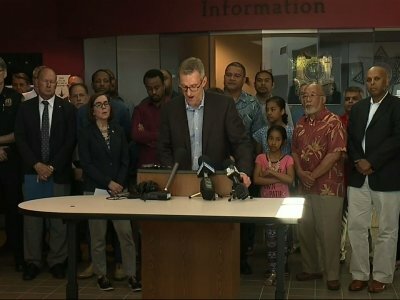 Mayor Ted Wheeler says in a statement Tuesday that acts of violence and vandalism aren't political speech, but are a crime. PORTLAND, Ore. (AP) — Portland Mayor Ted Wheeler declared the city "open for business" to companies developing autonomous vehicles. Wheeler and Transportation Commissioner Dan Saltzman directed the Transportation Bureau to draft policies for autonomous vehicles that would give developers a path to apply for permits to test them within the city, including on open, public roads. PORTLAND, Ore. (AP) — Portland's police chief has been returned to full duty by the city's mayor. The Oregonian/OregonLive reports (https://goo.gl/xywsKq ) Mayor Ted Wheeler returned Mike Marshman to duty Wednesday. The mayor says Marshman didn't violate policy based on an initial review of an investigation into whether someone signed the chief's name on a training log in March, when he hadn't attended the session. PORTLAND, Ore. (AP) — Portland and Multnomah County have pledged to completely transition to renewable energy sources by 2050.